250mm (10") Coco complete with 48" handle Natural coco fibre bristles Suitable for indoor or ..
330mm (13") Bass brush complete with 54" handle Bassine and cane bristle mixture Robust woode..
450mm (18") Coco Platform Brush. This platform brush has a 18" head with soft coco fibres Co..
450mm (18") Bass Platform Brush. This platform brush has a 18" head with stiff bass..
600mm Bass Platform Brush. 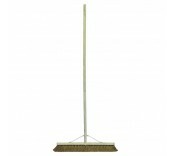 This platform brush has a 600mm wide head with stiff bassi..
900mm (36") Coco Platform Brush. This platform brush has a 36" wide head with soft coco fi..
900mm (36") Bass Platform Brush. This platform brush has a 36" wide head with st..